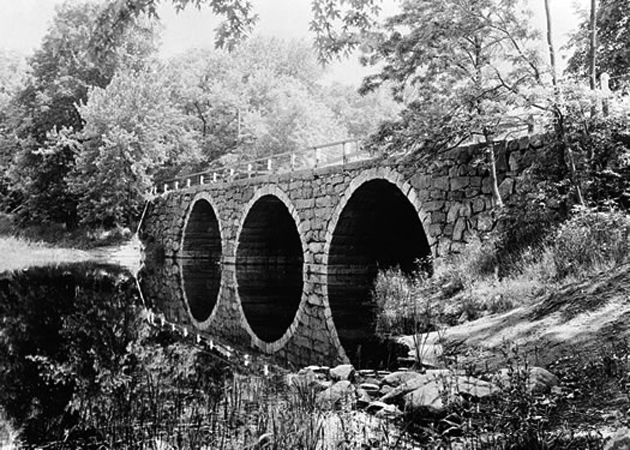 The triple stone arch Warner Bridge that connects Mill Rd. in Ipswich to Highland St. in Hamilton was designed by architect Henry Hubbard. 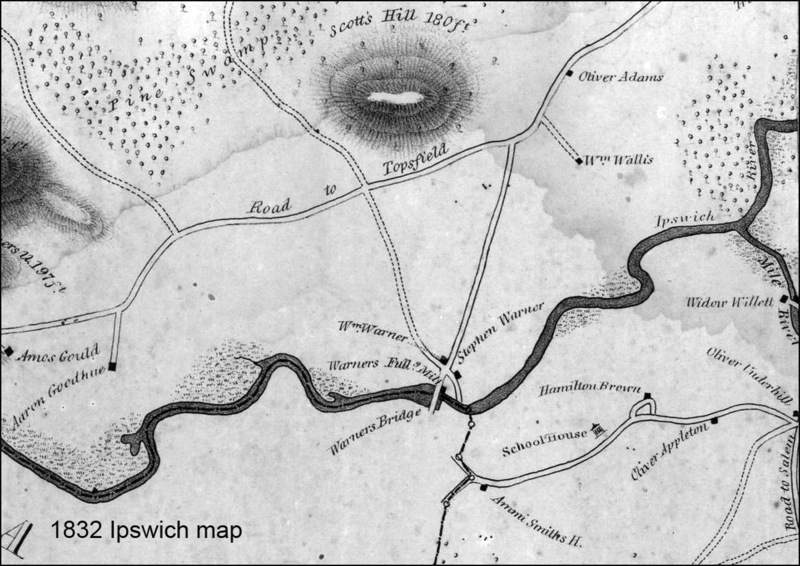 Thomas Franklin Waters wrote that it was first constructed in 1829, and Ipswich town history records that it was “rebuilt” in 1856. 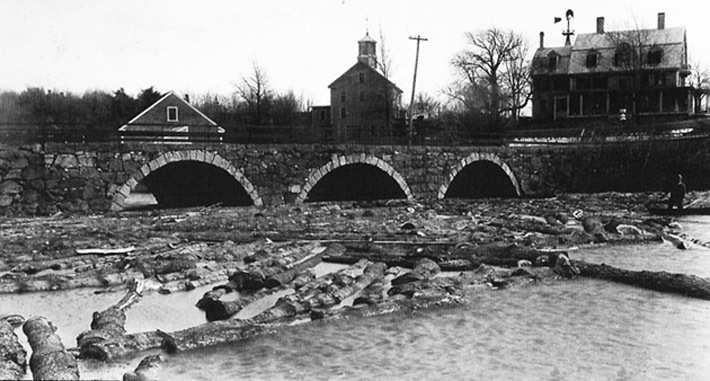 In 1931, the roadway was raised; stone parapets and the wooden sidewalk on the upstream side were added. 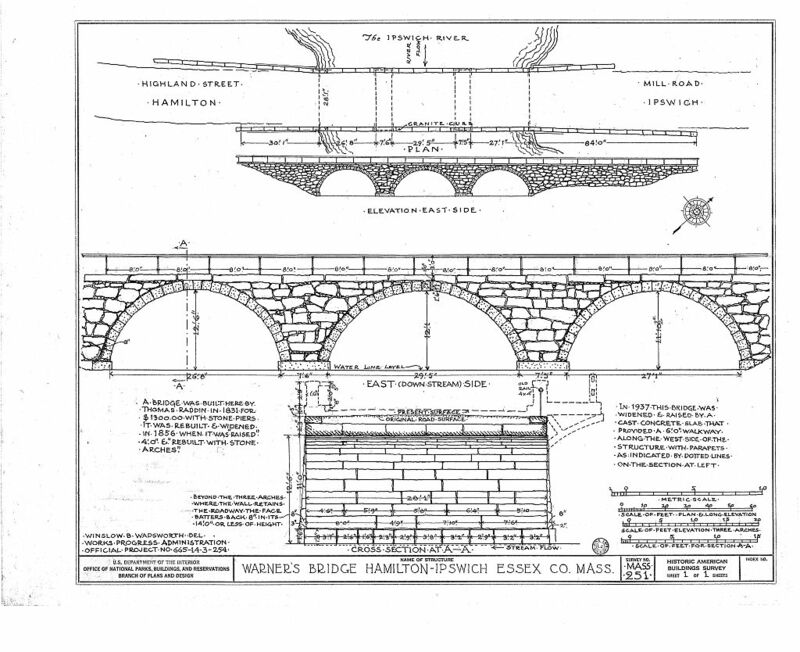 The arches of the Mill Road bridge are “dry-laid,” without any mortar. During the 2006 “Mothers Day Flood,” the bases of the two piers were undercut by the force of the water, and a serious dip formed in the roadway, as can be seen in the photo below. There was fear that the bridge could collapse into a giant pile of rocks in the river. As part of repairing the flood damage, holes were drilled through from one side to the other and giant steel rods inserted and bolted. The ends of the bolted rods were plugged with stone. 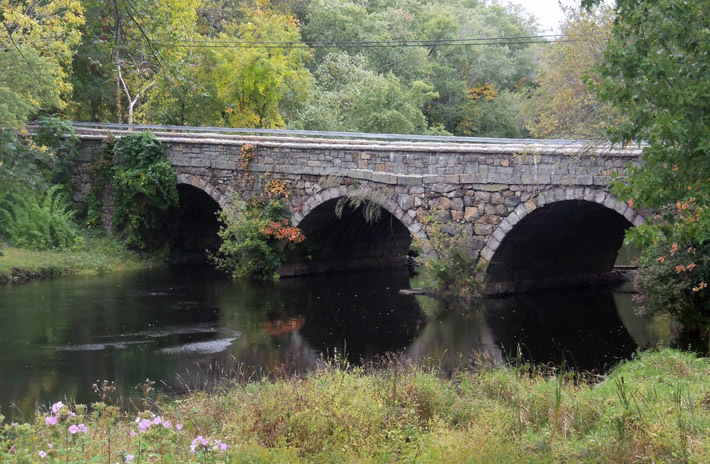 The Warner bridge on the Ipswich River connects Ipswich and Hamilton. The 2006 Mothers Day storm undermined the pillar supporting the two arches on the right, causing the roadway to sag, as seen in the photo. “Sargent Nicholas Wallis received permission in March, 1686-7 to improve the water by damming in the river against his own land, not exceeding three foot, for the building a fulling mill or mills, provided he do it within a year and a half. Sergeant Wallis did not improve his privilege, and in March. 1696-7, John Adams, Sen., his son John, Jim. and Michael Farley Junior petitioned the Town for permission to build a dam, and operate a grist mill and a fulling mill. After a little delay, they received the desired liberty, and built the dam, with a fulling mill on the north side and the grist mill on the south, in the year 1697. “In the Spring of 1820, the Warners and others petitioned the Court of Sessions for a bridge. The Town opposed but the Court ordered it built. The Town then petitioned for a discontinuance of the road. Another petition was filed by the Warners in the following year with no better success. Five years then elapsed. The petitioners were as determined as the Town, and in 1829, they secured from the County officials a fresh order to the Town to proceed. The bridge was built, a beautiful three-arched structure of granite, but the Town voted in July, 1832, to employ Rufus Choate “and such other learned and respectable counsel as may deem proper,’* to contest payment of any portion of the expense. The case went to the Supreme Court, which rendered an adverse decision in November, 1833, and assessed the Town $1498. 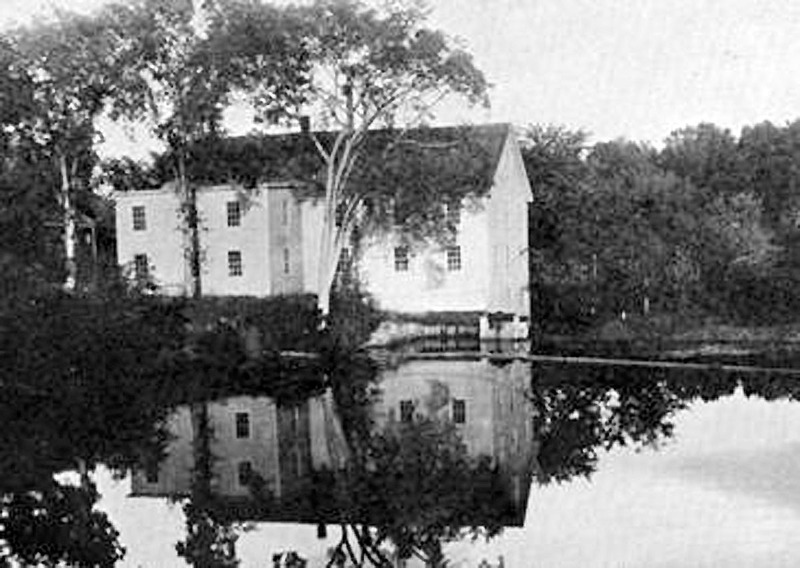 The Warner Isinglass Mill sat on the downstream Ipswich side of the bridge, in front of the Caleb Warner house. The dam visible in this photo but long gone, created a mill pond above the dam. Caleb Norwood purchased the properties from the Warner heirs in 1880. He built a large four story mill below the house to manufacture isinglass, a collagen from the air bladders of sturgeon, cod and carp, which is converted into gelatin. This form of isinglass was used in the clarification of wines and beers and for thickening confectionery and glues. Thirty five employees processed 100,000 lbs of isinglass yearly. After the mill closed in 1912, the building was unusable for any other purpose and was demolished. The mills on the Hamilton side of the river ceased to operate in 1919 and the sawmill still stands. The Massachusetts isinglass industry began in 1822 in Rockport. In the procedure the cleaned sounds (bladders) are soaked and softened to the desired consistency then converted into ribbon isinglass by rollers, then dried. Isinglass was manufactured only in the cooler months because of rapid putrefaction in hot weather. Fish glue nonetheless has a pronounced odor and the area around the factory surely reeked. 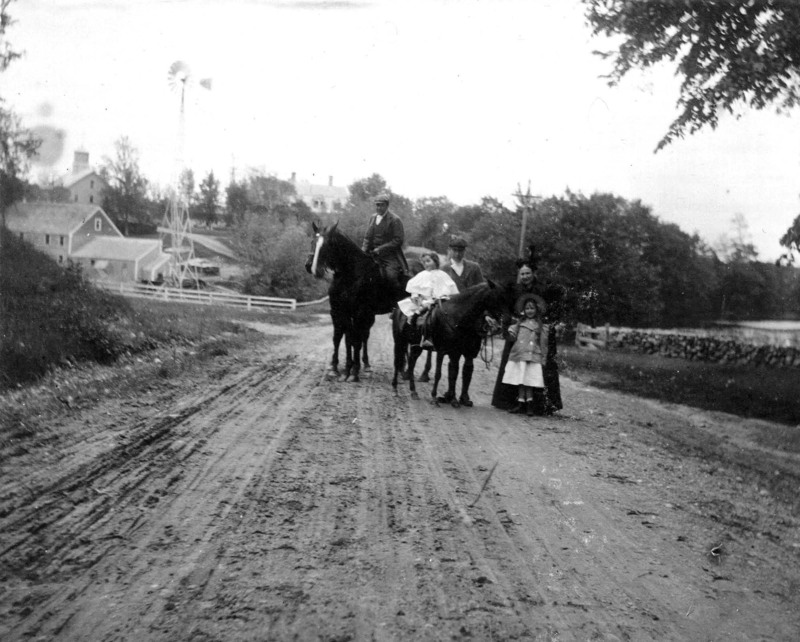 Members of the Appleton Family on the Mill Road side of Warner’s Bridge, courtesy of David Thayer. 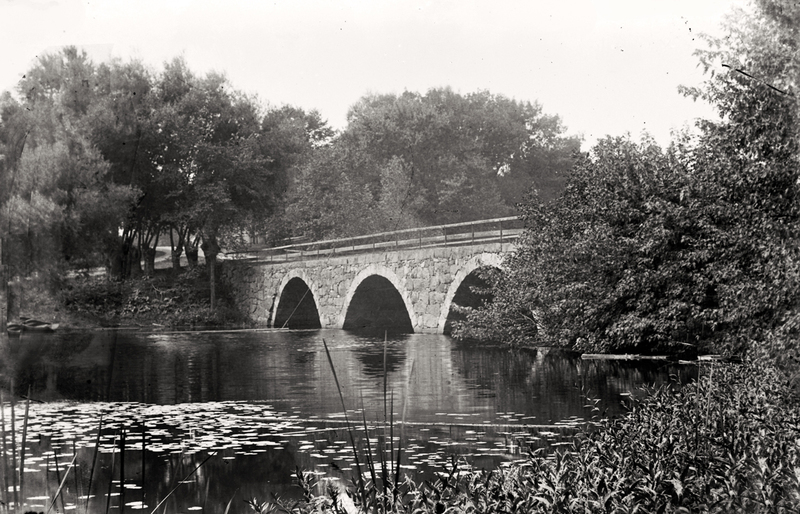 An early photo of the old Mill Road bridge. 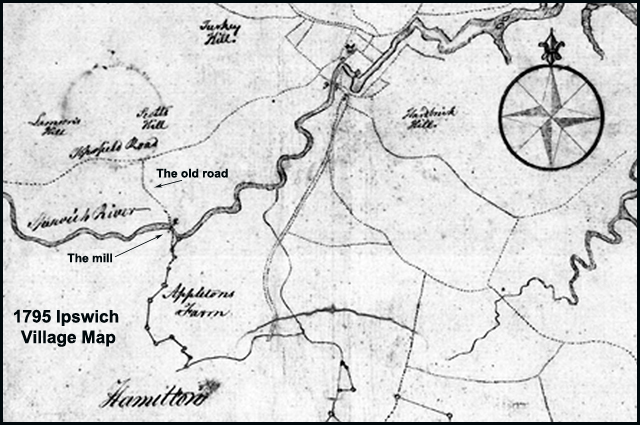 The sawmill on the Hamilton side of the river still stands. The house in the background is probably the Norwood house that was moved to the other side of Highland St. In front of the sawmill is the frozen mill pond. The tall building behind the sawmill may be the Norwood barn, apparently moved across Highland Street where it still stands today as a residence. 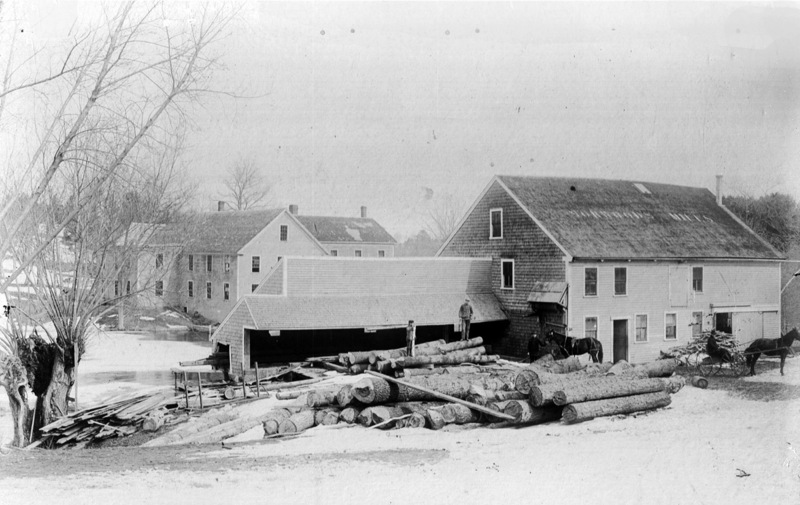 Logs were floated downstream to the sawmill, the building on the left. 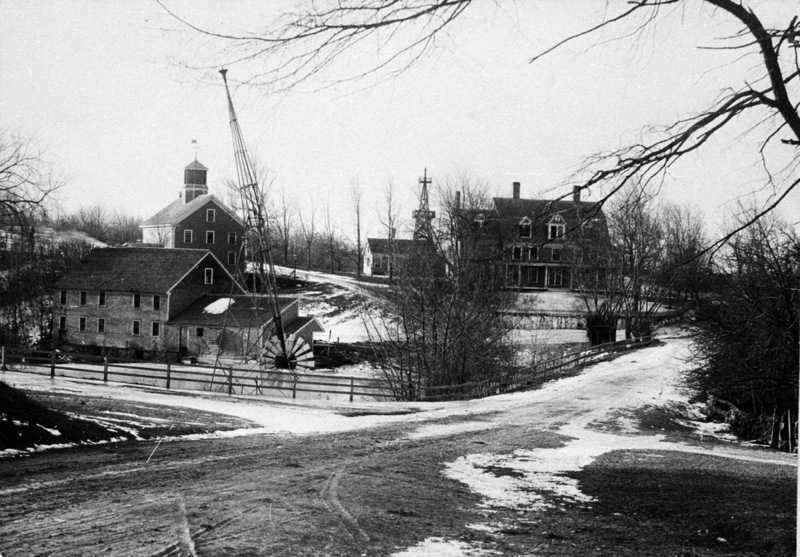 The Norwood mansion on the far right was later moved across Highland St. to its current location. Opposite the isinglass factory and still standing on the Hamilton side of the river is an old grist mill building which also served as a saw mill and cider mill. The grist mill processes almost seven thousand bushels of corn each year, and the cider mill annually produced 2000 barrels. 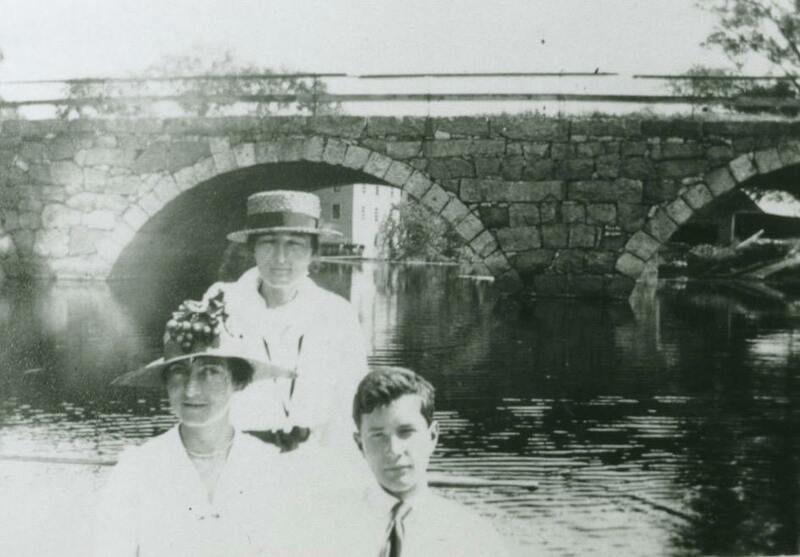 Violet Thayer and family members upstream from the Mill Rd. bridge in 1916. Photo courtesy David Thayer. The Isinglass factory can be seen through the arch on the left, and the old mill is visible on the right. The old sawmill still stands. All that’s left of the large isinglass factory across the river are a few foundation stones near the river.